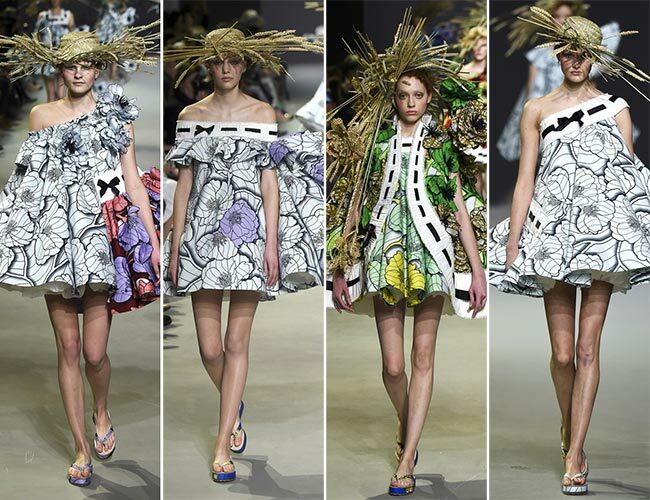 The Amsterdam based fashion house founded in 1993 by Viktor Horsting and Rolf Snoeren, is definitely one to look for on the Paris Haute Couture Fashion Week‘s runways. After all, their couture is generally very intriguing, this year reminding us of country doll dresses with tons of straw, floral prints, and layer upon layer of pleated ruffles. It’s a garden that we see, worn by long legged beauties, with puffed up skirts and thigh-skimming lengths at the hem. 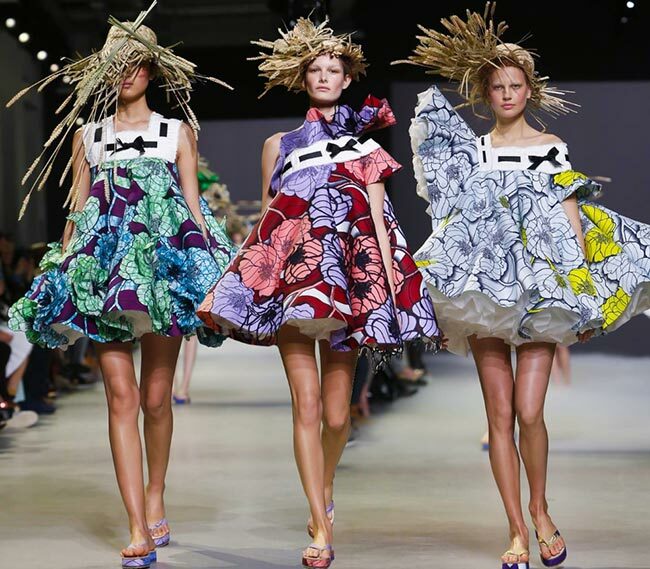 The Viktor & Rolf Couture spring/summer 2015 collection certainly was a colorful show that any and all who watched greatly enjoyed. Viktor and Rolf started with ready to wear fashions in 2000, though back in 1998, they held an unauthorized show during the Paris Fashion Week in order to attract members of the press. 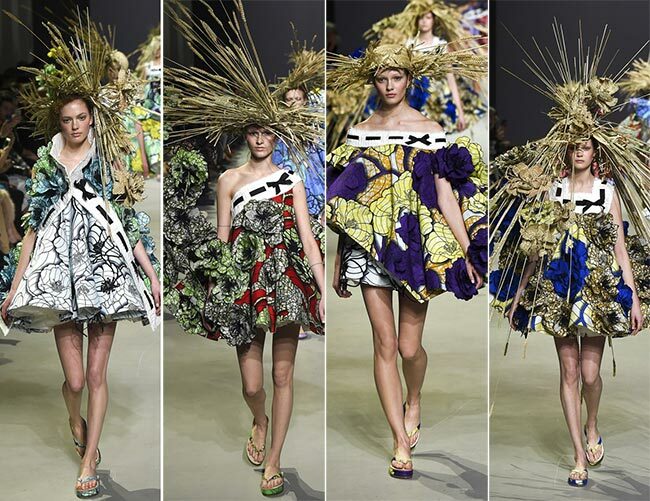 They’ve been innovative and gone to new lengths to bring the focus onto their works, including creating a “Russian Doll’ out of model Maggie Rizer, who was dressed in layer after layer of couture dresses, all piled on top of the other. They’ve done clothing, both couture and ready-to-wear, as well as accessories, while also taking on contracts to develop perfumes for different companies. When it came down to presenting their couture designs on the runway today, the house had 20 options to display, all of which had a similar theme. It’s as if there was a story to be told of a young girl in the middle of winter (for she wore white with black swirls, the bow on her chest denoting her age) who slowly grows into the harbinger of spring weather, beginning with melting the snows and having the streams gurgle in their blue colors, before the daffodils bloom and aqua joins yellows, then purples and finally reds, and finally it appears as if she brings the wheat harvest of autumn, the blue flowers giving way to browns and mustard yellows instead of the spring sunshine seen at first. All the while, she never fails to carry a straw hat, knowing full well the harvest is the most important part of the year, but she also dares to enjoy the moments of beauty, of pure sunshine and the rains that ensure every bloom is as perfect, as vibrant as the next. Her dress is that of a doll, like those straw woven little toys that are believed to bring about a good yield if you care for it well and keep it in your home. The full skirts never pass the mini hem line, nor do they go so short as to be indecently exposing too many body parts. Instead, the straw doll attracts the attention of the farmer and bestows upon him a full year of luck and prosperity. 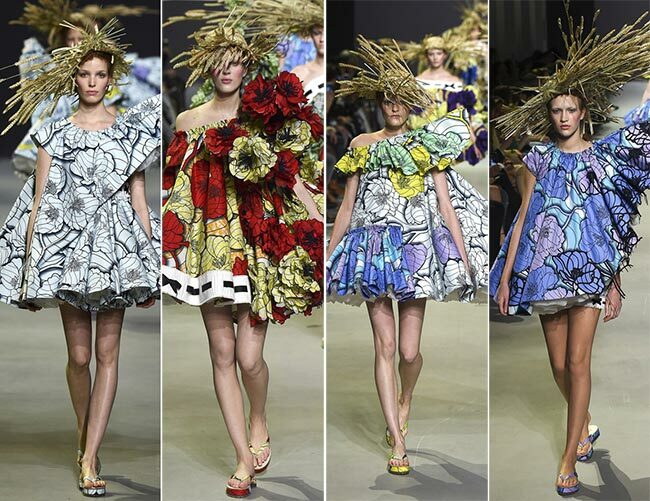 The Viktor & Rolf Couture spring/summer 2015 collection is not full of a wide array of choices in couture dresses to choose from, but what it lacks in numbers, it makes up for in incredibly vibrant coloring and whimsical design. It is clear that this fashion house is not your typical chic, sophisticated and often slightly strange French, Spanish or Italian style, nor does it find inspiration in the same places. Here, it’s the simple farmer, the countryside and the traditions held dear over the centuries.